In search of fine white wines, I always look forward to the northern vineyards of Europe. There the wines have bracing liveliness, and the local foods are a perfect match, whether simple mountain fare or delicate seafood from a nearby coast. My latest trip was to a far northern area of Italy called Collio, a garden-like district with very good white wines. I don’t know about you, but after learning that I am flying into the Venice airport, everything gets kind of dreamy. Will I be drifting through canals and strolling along picturesque cobbled paths on the Venetian islands? Will I head inland to the medieval city of Verona and step out onto Romeo and Juliet’s balcony? This June I drove through the bucolic landscape about an hour and a half northeast, to the castle-studded “Route of Wine and Cherries.” My destination was Collio, a tiny, hilly region tucked in between the Adriatic Sea and the foothills of the Alps, which makes a different style of white wines that tends to be gentler and slightly fruitier than other northern Italian whites you might have tasted. 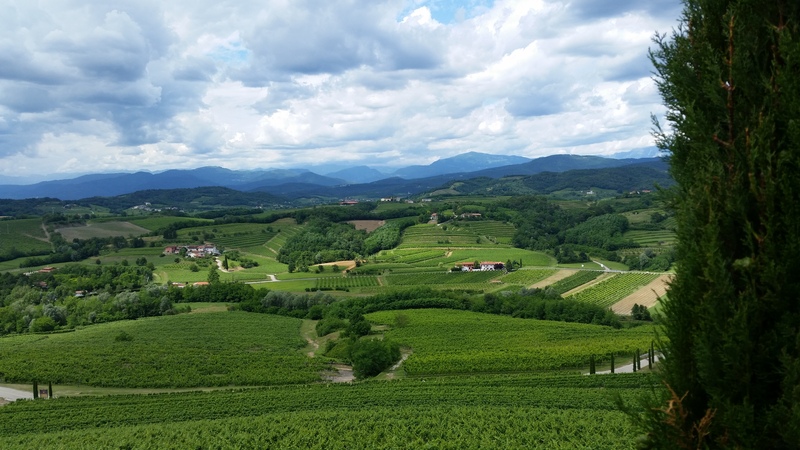 Collio has been part of a succession of empires over the past few thousand years: from the classic conquering Romans to the medieval Serene Venetian Republic to the authoritarian Austro-Hungarians of the 19th and early 20th centuries. After that, there was a sharp divide here during the 20th century, when this part of Italy and the adjacent Slovenia found themselves on opposite sides of the Iron Curtain. Yet it seems to me that the people of Collio carry their weighty history proudly as they go about their daily lives. They thrive in towns that were founded many hundreds, even thousands, of years ago, and cook with a mélange of culturally assorted foods. Even people’s first and last names are a testament of their Italian, Austrian and Slovenian heritage. With the current peaceful borders of Italy and Slovenia, it is impossible today to tell by looking at the landscape where one country ends and the other begins. The roads, rivers, vineyards, and forests of this area of the world follow the contours of the land seamlessly, as they have for thousands of years. 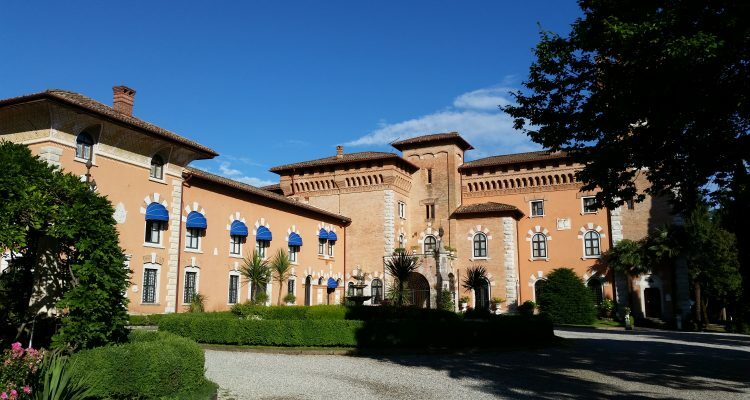 But now the winemakers of Collio are resolutely pursuing a campaign to tell the world about their wines, which have significantly improved during the past decade or so. This is due to strict work in the vineyards as well as in the wineries. With this determination to court worldwide awareness of their wines which is why I was invited this year – in the company of journalists from both Russia and China. And the winemakers have added another element to make it easier for us to recognize their wines: a distinctive bottle shape with a longer neck and more angled shoulders, reflecting the history of their wines, which first became well known in this part of Europe in the 1500s. 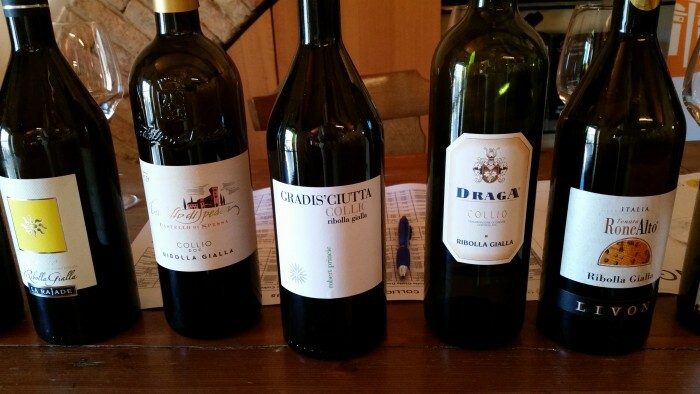 The wines’ longevity is perhaps one reason that Collio wines are not inexpensive. Another is scarcity: there are only 1,500 hectares (3,700 acres) of Collio DOC vineyards, and about half of the Collio wines are consumed in Italy. 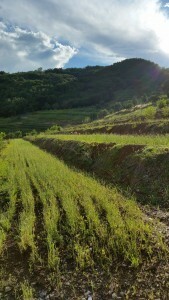 Collio’s vineyards in their garden-like scenery owe some of their appearance to a location an area with a high annual rainfall for Italy. Yet when I visited in early summer it was not grey, but full of sunshine and showers: sudden storms that blow quickly through the region. An afternoon breeze reliably dries off the grapes daily. During September the weather cools off, which helps to develop the aromatics in the grapes. And in the vineyards the influence of an eons-past seabed in earth is tempered by layers of marl and sandstone with some clay, so the wines’ flavors are rounded and less severely mineral. In fact, 80% of the wines made here are white, and that is what Collio is best known for. What does this mean to our palates? I found both the popular Pinot Grigio and Pinot Bianco wines were a bit fruitier here, while still showing some lively acidity and dry finishes. They were very approachable wines, good as aperitifs and pairing nicely with simple local cuisine. One of my favorite pairings was gnocchi with garden zucchini and fresh Adriatic shrimp. In addition to pinot grigio and pinot bianco, the major international grapes are sauvignon blanc, chardonnay, riesling, Muller-Thurgau, traminer, merlot, cabernet franc and pinot nero (pinot noir) – many of which have been cultivated here for 150 years. Indigenous white grapes here include ribolla gialla, malvasia Istriana, friulano (the former tocai friulano) and picolit, several of which are fairly difficult varieties to grow and/or vinify. With ribolla gialla – which has been documented here since the 12th century – small variations in vinification technique translate to large variations in the wines. And picolit is a tiny production here, mainly because the grape bunches are extremely sparse by the time they ripen since pollination is very difficult for this variety; it has traditionally also been made into a very good dessert wine. Malvasia Istriana, which originated in the nearby Istrian peninsula, is a good pairing for some of the heartier (oilier) Adriatic fish. The region’s signature grape, friulano, is, for some reason, a difficult sell in the US, I was told, perhaps because it’s not different enough from other better-known dry white wines. Friulano is also blended with other white grapes in Collio Bianco – which is a now DOC designation for local white blends. Along with upfront acidity, 100% friulano wine displays an element of stone fruit and sometimes tropical fruit on the palate. It has good body and pairs nicely with pastas with vegetables and the local montasio cheese. And with prosciutto San Daniele, the regional favorite which is a slightly milder prosciutto than many of us are used to. Another of my favorite foods to eat here is Frico, which is melted cheese crisps made with montasio cheese simply melted in a frying pan. At one reception I went to, Frico was handed out like lollypops: large, flat, lacey, savory cheese crisps on sticks – excellent with friulano and other local white wines. 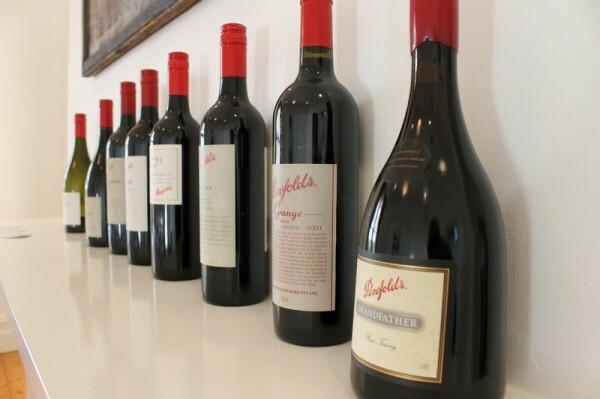 Speaking of parties and receptions, it is common here for winemakers to bottle some of their wines in magnums, which are considered necessary for parties. A great philosophy, to my way of thinking. And there is one more incentive to visit Collio (especially in the warmer months): the Collio region partners with Vespa, encouraging tourists to rent these iconic Italian motor scooters to see the sights in a more fun and leisurely fashion.